High-mobility group box 1 (HMGB1) is an important molecule for several nuclear processes. Recently, HMGB1 has gained much attention as a damage-associated molecular pattern (DAMP) and has been implicated in the pathogenesis of several (auto)-immune diseases, in particular, systemic lupus erythematosus (SLE). A main pathogenic feature in SLE is the accumulation of apoptotic cells. Since HMGB1 is released from apoptotic cells it has been hypothesized that HMGB1 might fuel the inflammatory processes, as seen in this disease, and play a fundamental role in the pathogenesis. In this review, we discuss evidence in support of the theory that HMGB1 is an important mediator in SLE and may be considered a new autoantigen. Systemic lupus erythematosus (SLE) is a systemic autoimmune disease, characterized by the involvement of many organs and the presence of autoantibodies directed to nuclear and cytoplasmic antigens. The pathogenesis is unknown; it is assumed that a disturbed clearance of apoptotic cells plays a central role. Several lines of evidence support that accumulation of apoptotic cells is instrumental in the development of SLE. In several animal models, deficiency of proteins such as complement factor C1q and serum amyloid P component (SAP), which are involved in opsonization and thereby phagocytosis and clearance of apoptotic cells, results in spontaneous development of lupuslike features, including production of autoantibodies and proliferative glomerulonephritis (1,2). Furthermore, injection of apoptotic cells result in development of SLE-like disease (3). Also in human SLE, accumulation of apoptotic cells has been found. In peripheral blood, increased levels of apoptotic lymphocytes (4) and neutrophils (5) have been demonstrated. Moreover, in lymph nodes from lupus patients apoptotic lymphocytes are present (6). In the skin of lupus patients, after UVB irradiation, in comparison to healthy controls, apoptotic cells accumulate. Importantly, in the vicinity of these cells, inflammatory lesions occurred (7). Apoptotic cells express antigens on their cell surface that serve as targets of the autoimmune response that is typical of the disease, in part because these antigens may undergo posttranslational modifications during the process of apoptosis. Moreover, when apoptotic cells are not cleared, these cells turn into necrotic cells that lose their membrane integrity, thereby releasing intracellular structures that can act as autoantigens. In this context, nucleosomes, bound to the nuclear protein high-mobility group box 1 (HMGB1), were shown to induce not only immune, but also inflammatory responses that are relevant for the pathogenesis of SLE (8). In this review, after a short summary of HMGB1 functions, we will discuss the (potential) contribution of HMGB1 in the different stages SLE development. HMGB1 is a nonhistone nuclear protein that has several functions, depending on its location and posttranslational modifications. HMGB1 is a highly conserved protein of 215 amino acids that is ubiquitously expressed in nuclei where it binds to DNA. The protein can be divided into three separate domains: the A box, B box and acidic tail. Box A serves as a competitive antagonist for HMGB1 and inhibits HMGB1 activity. Both A and B box are important for its DNA binding functions and are positively charged, whereas the tail is negatively charged, giving the molecule a bipolar charge. HMGB1 is important in several DNA-related biological processes, reflected by the fact that HMGB1 can bend promoter regions and can interact directly with nucleosomes, thereby altering the accessibility of the DNA (9). The importance of HMGB1 was demonstrated by the fact that mice deficient for the protein die within 24 h after birth because of severe hypoglycemia. In contrast, fibroblast cell lines, derived from the same HMGB1−/− mice, can proliferate and survive, indicating that the effects might be cell specific (10). HMGB1 can be released from the cell into the extracellular space, where it acts as a damage-associated molecular pattern (DAMP) or alarmin. Translocation from the nucleus to the cytoplasm occurs through acetylation of lysine residues, where the protein is concentrated in vesicles for secretion (11,12). The extracellular release of HMGB1 can occur either passively or actively by secretion. More importantly, the manner of release determines posttranslational modifications of released HMGB1. Passive release of HMGB1 usually results from leakage due to damaged cell membranes. Active release by secretion occurs when immune cells are exposed to, for instance, pathogen-associated molecular patterns (PAMPs), tumor necrosis factor (TNF)-α or lipopolysaccharide (LPS) via nonclassical pathways. When present in extracellular space, HMGB1 exerts several functions, including cytokine release by monocytes (13, 14, 15, 16), cell migration (17), wound healing (18) and neovascularization (19). Extracellular HMGB1 can bind to several receptors, including toll-like receptor (TLR)-2, -4 and -9; receptor for advanced glycation end products (RAGE) and chemokine receptor C-X-C motif receptor 4 (CXCR4) (17,20,21). RAGE, both in soluble and membrane form, was the first receptor demonstrated to bind HMGB1. RAGE is a transmembrane, multiligand member of the immunoglobulin superfamily expressed on monocytes, macrophages and other cells (22). Binding of HMGB1 to RAGE initiates cell migration-dependent pathways via nuclear factor-κB activation (23,24). Moreover, cell migration can also occur when HMGB1 is complexed to chemokine CXCL12, and then it acts synergistically through CXCR4 (17,25). Recently, binding of HMGB1 to its receptors was shown to be related to the different redox states of HMGB1. Several studies showed that when a disulfide bridge exists between cysteines C23 and C45, and cysteine C106 is in a thiol (reduced) state, HMGB1 exerts cytokine-inducing properties via binding to TLR4 (25, 26, 27). Adding this cytokine HMGB1 to RAW 264.7 macrophages induced expression and release of TNF, whereas completely reduced HMGB1, which can be produced in the presence of dithiotreitol (DTT), did not (25, 26, 27). HMGB1 has chemoattractant properties when all three cysteines are reduced. By using a migration assay, mouse fibroblasts migrated toward increasing concentrations of all-thiol HMGB1 (17,25). Moreover, it was shown that the cytokine and chemoattractant properties of HMGB1 are mutually exclusive because of these different redox statuses of HMGB1: all-thiol HMGB1 failed to induce cytokine production, while disulfide HMGB1 did not attract mouse fibroblasts (25). When HMGB1 is released from apoptotic cells, it induces immunogenic tolerance and has no chemotactic properties, since its three cysteines are terminally oxidized by reactive oxygen species to sulfonates (11,25,27). However, when HMGB1 is released from necrotic cells, it still has inflammatory properties, as shown by the fact that necrotic HeLa HMGB1−/− cells do not induce TNF production in monocytes, whereas wild-type cells could induce TNF (12). Next to binding to CXCL12, as described before, HMGB1 forms complexes with several other molecules, including LPS, interleukin (IL)-1, —C—phosphate—G— (CpG), double-stranded DNA and nucleosomes. Hreggvidsdottir et al. (28) showed that HMGB1 forms highly immunostimulatory complexes with LPS and Pam3CSK4, thereby increasing response in macrophages up to 100-fold. These authors furthermore showed that signaling of these complexes was primarily done by TLR4 and TLR2 and not by additional signaling cascades. In SLE, formation of many immune complexes is well described, and it has been shown that HMGB1 bound in these complexes is present in plasma and serum of SLE patients (29, 30, 31). Tian et al. (29) showed that HMGB1 bound to CpG motifs induced cytokine production by interacting with RAGE and not TLR2 or TLR4. Moreover, they showed that a monoclonal antibody to HMGB1 significantly reduced interferon (IFN)-α production in peripheral blood mononucleated cells stimulated with plasma from lupus patients containing HMGB1-CpG complexes (29). HMGB1 complexes were also implicated in the pathogenesis of lupus nephritis. Qing et al. (32) showed that the pathogenic anti-DNA antibody 1A3F could bind to HMGB1 and HMGB1-DNA complexes. 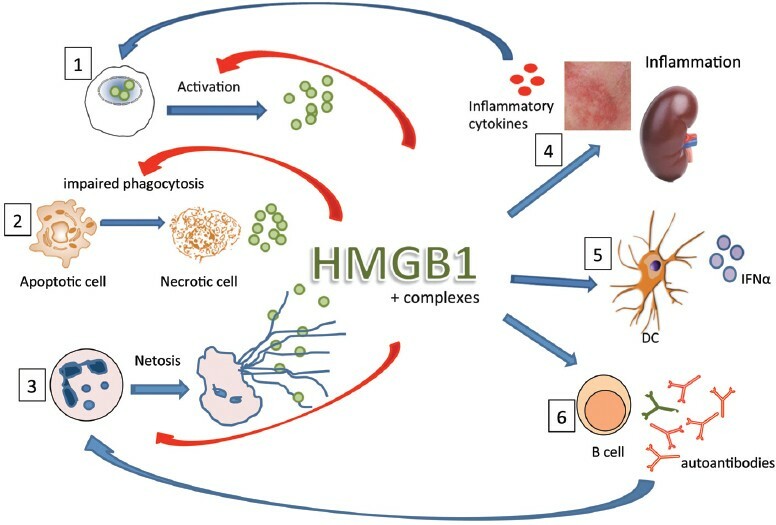 HMGB1 and 1A3F exhibited a synergistic proinflammatory effect in the kidney, where increased expression of HMGB1 was found in lupus patients but not in patients with other types of renal disease. They concluded that HMGB1 may act as a proinflammatory mediator in antibody-induced kidney damage in SLE. More recently, it was shown that HMGB1 has a role in autoantibody induction itself. In SLE patients, circulating DNA-containing immune complexes induced anti-dsDNA antibodies. Importantly, HMGB1 in circulating DNA-containing immunocomplexes was crucial for anti-dsDNA antibody induction (31). By using box A to block the effect of HMGB1, the production of anti-dsDNA antibodies was abrogated in a dose-dependent manner, whereas adding HMGB1 to the culture system increased production of anti-dsDNA antibodies (31). However, unlike the previous study by Tian et al. (29), here it was shown that the effect was solely mediated through TLR2 and MyD88. The data in this study are in line with the results found by Urbonaviciute et al. (30), who showed that injecting HMGB1-nucleosome complexes induced anti-dsDNA production through TLR2 in BALB/c mice. Furthermore, incubating human monocyte-derived macrophages with HMGB1-nucleosome complexes induced cytokine production, which could be blocked by adding box A. Whereas these studies focused on effects of HMGB1 on lymphocytes, Sun et al. (33) investigated the effect of HMGB1-containing immune complexes on human endothelial cells. They showed that stimulating endothelial cells with immune complexes from SLE patients increased proinflammatory cytokines such as IL-6 and IL-8. Furthermore, RAGE, vascular cell adhesion molecule (VCAM)-1 and inducible cell adhesion molecule (ICAM)-1 showed higher expression on the cell surface. These effects could be blocked by adding box A or soluble RAGE, indicating that HMGB1 plays an important role in mediating inflammation in endothelial cells. Taken together, these studies show that HMGB1 mediates several roles by acting in immune complexes, depending on the effector cells and components that are present in these complexes. Phagocytosis (or efferocytosis) is an important mechanism that enables innate immune cells to clear cell debris and ingest microbes. Impaired phagocytosis of apoptotic debris has been implicated in SLE pathogenesis and leads to secondary cell necrosis and exposition of intracellular contents of the necrotic cells to the surrounding tissue, which in turn can induce a proinflammatory response (34). Serum factors, such as complement, are important for an effective phagocytotic response and were found to be decreased in SLE patients (35). HMGB1 has been described to be a factor that can contribute to a decrease in phagocytosis. In a series of articles by Abraham and colleagues, it was shown that HMGB1 has a negative effect on phagocytosis via different mechanisms (36, 37, 38). First, it was shown that HMGB1 can bind to phosphatidylserine (PS) present on the surface of apoptotic neutrophils. The presence of PS on the outer leaflet of cells is one of the most important “eat me” signals for macrophages. Accordingly, efferocytosis was inhibited when HMGB1 masked PS (36). Next, it was shown that when macrophages were pre-incubated with HMGB1, their ability to engulf apoptotic neutrophils and thymocytes was decreased. HMGB1 competed with the opsonin milk fat globule epidermal growth factor 8 (MFG-E8) for binding to integrin αvβ3, a receptor important in recognizing PS. MFG-E8 was shown to act as a bridge between PS and to integrin αvβ3, thereby enhancing efferocytosis (37). RAGE-deficient macrophages were shown to have a diminished capacity to phagocytose, and the inhibitory effect of HMGB1 on phagocytosis was contributed to the C-terminal tail of the protein. When the C-terminus was eliminated, the inhibitory effect of HMGB1 was greatly diminished, attributed to the fact that HMGB1 was not able to bind to RAGE in vitro and in vivo (38). 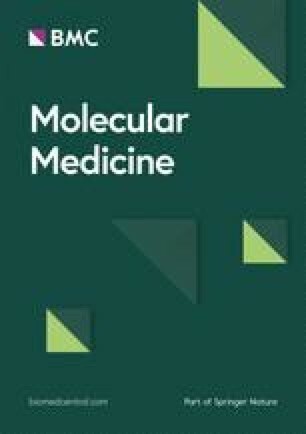 Moreover, it was shown that PARPylation of HMGB1 by PARP-1 [poly(ADP)-ribose polymerase] enhanced the capacity of HMGB1 to inhibit efferocytosis, indicating that posttranslational modifications of HMGB1 play a role. PARP-1 was implicated in inflammation, and activation of PARP-1 induces migration of HMGB1 from the nucleus to the cytoplasm. It was shown that after stimulation of TLR4, PARPy-lated HMGB1 was secreted, which could inhibit efferocytosis more efficiently than non-PARPylated HMGB1 by enhanced binding to PS and RAGE (39). Lastly, it was shown that intracellular HMGB1 also diminishes the phagocytosis by macrophages through interactions with Src and focal adhesion kinase (FAK). Knockdown of intracellular HMGB1 by siRNA increased phagocytosis and cytoskeletal rearrangement, in which FAK plays an important role (40). As HMGB1 serum levels are increased in SLE patients (which will be discussed later on), it seems logical that serum HMGB1 can contribute to the impaired phagocytosis described in SLE patients. However, at this moment, there are no reports that address this issue. In addition to apoptosis and necrosis, a new form of cell death was described in 2004 by Brinkmann et al. (41). They showed that neutrophils can entrap microorganisms by a programmed externalization of chromatin fibers decorated with antimicrobial proteins derived from granules. This process was called neutrophil extracellular trap (NET) formation or NETosis, and the processes involved leading to NETosis were investigated in detail (42). The first link between NETosis and autoimmunity was observed in small vessel vasculitis, where it was shown that NETs externalize the autoantigens proteinase 3 (PR3) and myeloperoxidase (MPO) and that antineutrophil cytoplasmic antibodies (ANCAs) induce NETosis (43). In 2011, enhanced NETosis in SLE patients was described (44, 45, 46). Normally, NETs are degraded by DNase-1 in the circulation, but the ability to reduce NETs is diminished in SLE patients and is associated with disease activity (47). Villanueva et al. (46) showed that low-density granulocytes spontaneously can form NETs. Low-density granulocytes are a neutrophil subset that can be found in the mononuclear cell fraction, and they have been reported to be present in all SLE patients (48). Comparing gene array profiles of low-density granulocytes to normal density neutrophils showed that low-density granulocytes significantly overexpressed mRNA of various immunostimulatory bactericidal proteins and alarmins, relative to lupus neutrophils and control neutrophils. Next to spontaneous NET formation in SLE patients, it was shown that autoantibodies such as anti-RNP (anti-ribonucleoprotein) or immunogenic complexes composed of neutrophil-derived antimicrobial peptides and self-DNA can induce NETosis (44,45). NETs can stimulate plasmacytoid dendritic cells to produce type I interferon (IFN-α), which has an important role in pathogenesis of SLE (44, 45, 46). NETs contain DNA and much HMGB1 and LL37, a cationic antimicrobial peptide that converts self-DNA and self-RNA into TLR activators (44). These neutrophil proteins facilitate the uptake and recognition of mammalian DNA by plasmacytoid dendritic cells. Next to being excreted by neutrophils, HMGB1 also induces NETosis in neutrophils by interaction through TLR4 but not through RAGE (49). This result has not been confirmed by other studies until now and has not been investigated in neutrophils from SLE patients. Different groups have shown that HMGB1 levels are elevated in serum and plasma samples from patients with SLE (50, 51, 52, 53, 54). In addition, it was shown that HMGB1 correlated with the SLE Disease Activity Index (SLEDAI) and anti-dsDNA, whereas there was an inverse correlation with complement C3 (50,55). An important feature of SLE is the production of autoantibodies against several different nuclear and cytoplasmic proteins. Indeed, also antibodies to HMGB1 were found in SLE, which seems specific to the disease, since these antibodies were not found in patients with systemic vasculitis (50,56,57). Interference of these antibodies with detection of serum HMGB1 by enzyme-linked immunosorbent assay (ELISA) was noted (50,58), and it seems that the best way to detect HMGB1 in the serum of SLE patients is by immunoblot. The presence of anti-HMGB1 antibodies correlates with serum HMGB1, SLEDAI and anti-dsDNA antibodies (50), indicating that these antibodies might have a pathogenic role. In sepsis, however, a protective role of anti-HMGB1 antibodies was found (59), initiating a debate about the role of these antibodies. Epitope mapping of the anti-HMGB1 antibodies revealed that the majority of the antibodies reacted against box A (56), indicating that box A is not a treatment option for SLE. It might be expected that box A in lupus will be neutralized. In contrast, in animal models in other diseases in which anti-HMGB1 antibodies are not present, such as sepsis, administration of box A is beneficial (60). In several other autoimmune diseases, such as Sjögren syndrome, juvenile arthritis and rheumatoid arthritis, it was documented that serum levels of HMGB1 are increased in patients compared with healthy controls, showing that increased HMGB1 levels are not a specific feature of SLE (61, 62, 63, 64, 65) (Table 1). Wibisono et al. (66) investigated HMGB1 levels in patients with ANCA-associated vasculitis (AAV), and they found significant increased HMGB1 levels in patients with active granulomatosus with polyangiitis (GPA), but not in patients with microscopic polyangiitis (MPA). These data were confirmed by Bruchfeld et al. (67), who also found increased HMGB1 levels in GPA patients with renal involvement, and by Henes et al. (68), who showed a correlation between HMGB1 and the burden of granulomatous inflammation. Recently, however, HMGB1 was described not to be a useful biomarker in AAV, because HMGB1 levels were not associated with an increased risk for relapse in AAV (57). In ankylosing spondylitis patients, HMGB1 levels were reported slightly elevated compared with healthy controls as well (69). Importantly, when comparing amounts of HMGB1 in serum in these different rheumatic diseases, levels are moderately increased compared with healthy controls (Table 1). In contrast, we found in 33 quiescent SLE patients (SLEDAI <4), with low amounts of anti-HMGB1, an average level of HMGB1 of 6.2 ng/mL (range 1.3–32.3) measured by ELISA (50). As mentioned before, ELISA is not suitable for measuring HMGB1 in active SLE patients, but from these data, it is suggested that active SLE patients will have much higher amounts of HMGB1 in their serum. Recently increased HMGB1 levels were reported in juvenile SLE patients (70). Serum HMGB1 levels in different rheumatic diseases. Data are means ± standard deviation or median (range). AU, arbitrary units; HC, healthy controls; WB, Western blot. As mentioned above, redox status plays an important role in HMGB1 functionality. Until now, one report has investigated the redox status of HMGB1 in serum of SLE patients. It was shown that oxidized HMGB1 is present in these serum samples. However, this study included only a small number of patients with severe disease activity (71). More research is needed in larger patient groups with different disease activity to investigate which isoforms of HMGB1 are present in serum of SLE patients. In patients with renal involvement, higher HMGB1 levels were observed in serum compared with patients without renal involvement (50,52). In kidney biopsies of patients with lupus nephritis, cytoplasmic and extracellular HMGB1 was found (54,55), which was not present in control tissue. Furthermore, HMGB1 was detectable in urine of patients with lupus nephritis, but not in healthy controls, and correlated positively with serum HMGB1, proteinuria and SLEDAI and inversely with complement C3 levels. Strong expression levels of the receptors for HMGB1 (RAGE, TLR2 and TLR4) were seen in kidney tissue from patients with active lupus nephritis, indicating that HMGB1 can exert it functions (55). These studies suggest that HMGB1 might serve as a marker of disease activity in SLE patients, especially in those with renal involvement. Research on the effects of ultraviolet irradiation on the skin of lupus patients showed that exposure to ultraviolet light induces apoptosis of keratinocytes and the release of proinflammatory cytokines (72). In susceptible patients, the presence or even accumulation of apoptotic cells after ultraviolet exposure results in the induction of characteristic inflammatory skin lesions, which might be due to a delayed and proinflammatory clearance of these apoptotic cells. A few studies analyzed the presence of HMGB1 in the skin of patients with cutaneous lupus. A higher expression of cytoplasmic and extracellular HMGB1 was observed in lesional skin of lupus patients. Extracellular HMGB1 was only observed in lesional skin and not in healthy subjects (73). Moreover, in experimentally photo-provoked lesions, the number of HMGB1-negative cells increased, and cytoplasmic HMGB1 was significantly more present in active lesions (74). These two studies, however, only used skin of patients who were photosensitive, whereas the study by our group also investigated the role of HMGB1 in skin of lupus patients, irrespective of having a history of photosensitivity (75). After irradiation, the number of negative nuclei indicating translocation of HMGB1 to the cytoplasm significantly increased in patients compared with healthy controls. In patients, there was also a significant correlation between the presence of apoptotic keratinocytes, also called sunburn cells, and HMGB1-negative nuclei. Moreover, in patients, there was a significantly higher influx of inflammatory cells compared with healthy controls, but there was no correlation with number of negative nuclei, indicating released HMGB1. Together, these studies show that HMGB1 plays a proinflammatory role in cutaneous lupus. HMGB1, as has been shown in this review, plays an important role as an inflammatory mediator in SLE and can act alone or in complex with several other molecules. In Figure 1 the role of HMGB1 in SLE is depicted. Currently, most studies have focused on observations that HMGB1 is increased in lupus patients, either in serum, urine, kidney or skin. To our knowledge, there are no intervention studies blocking the effects of HMGB1 in lupus animal models or in SLE patients. Several different animal models of (autoimmune) disease use blocking agents, such as box A or neutralizing antibodies against HMGB1 to alleviate symptoms of disease (60). Because of the increase of HMGB1 in serum of SLE patients, this seems to be an appealing option. However, because anti-HMGB1 antibodies are present in sera from SLE patients that recognize box A, these two treatments do not seem like a feasible option for SLE. In animal models, other interventions have been tested, such as small interference RNA (siRNA), metformin (an antidiabetic drug) and glycyrrhizin, a small molecule that can bind directly to HMGB1 (60). Most work has been done in LPS-mediated mice models or sepsis models, and more research is needed to translate these findings to autoimmunity and SLE specifically. Role of HMGB1 in pathogenesis of SLE. In SLE, release of HMGB1 can occur via different routes: first, HMGB1 can be released from activated cells in an inflammatory environment; second, in SLE, apoptotic cells are not cleared properly because of impaired phagocytosis, which can lead to necrotic cells, which in turn release HMGB1; third, in SLE, low-density granulocytes are present that can spontaneously form NET (neutrophil extracellular traps), a process that leads to externalization of cellular content including HMGB1. In circulation or at inflammatory sites, HMGB1 can form complexes with DNA, nucleosomes, LPS or cytokines. HMGB1 alone or in complex can induce inflammation, for instance, in the kidney or in the skin of lupus patients (4), which in turn can lead to production of inflammatory cytokines. Also, complexed HMGB1 can activate plasmacytoid dendritic cells to produce IFN-α (5), a driving cytokine in lupus pathogenesis. Lastly, complexed HMGB1 can stimulate B-cells to produce autoantibodies (6). These activations lead to an inflammatory loop in which cytokines activate other cells, autoantibodies play a role in NETosis and HMGB1 itself can also induce NETosis and can play a role in the impaired phagocytosis. Open image in new window , HMGB1; Open image in new window , IFN-α; Open image in new window , inflammatory cytokines. Exploring the mechanisms behind HMGB1-induced inflammation in SLE is needed, since there is still much unknown. Much knowledge about HMGB1 biology has already been amassed by in vitro studies that investigate the pathways, receptors and posttranslational modifications; however, most of the studies have not been translated to disease models. Future studies, in lupus animal models and in SLE patients, should focus on delineating the kinetics, cellular location and redox status of HMGB1.